Paint your existing cabinets– If you like the layout of your kitchen and the style of your cabinets, you can give them an instant face lift by applying a coat of primer, two coats of paint and a protective top coat. Beware, that this is a very involved DIY project. To do it correctly, you need to remove all the doors, remove the hardware, tape the hinges, paint the base cabinets and use a sprayer to paint and topcoat the doors outside so you don’t see brush marks. It will take most DIY-ers 3-4 weeks of nights and weekends to complete this project. But, the results will be AHmazing. This was our dark kitchen before the update. 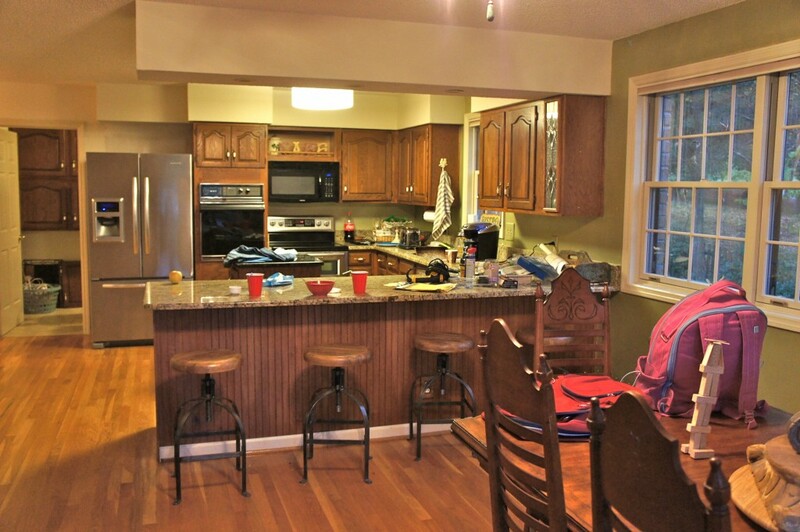 After some minor carpentry work we painted our kitchen cabinets for a totally updated look. Update your lighting– You would be amazed at what a difference it will make to replace fluorescent lights with incandescent lights. Florescent lights cast a blueish tint around the room. Incandescent lights cast a pure white light. Our current kitchen had fluorescent lights and a light with an alabaster shade. The alabaster light was throwing yellow light and the florescent light was casting blue. Updating those with bright white lights and adding about 10 can lights in the room made a HUGE difference. Paint the hardscapes– We recently worked with a client who wanted everything lightened up, but was reluctant to paint the red brick in the kitchen. It took lots of persuasion and photo examples to finally talk her into it, but it made ALL the difference. Her exact words to me were, “It looks 1000x better”. This is the kitchen brick before and after painting with Annie Sloan Chalk Paint. Red kitchen brick before painting. For this project we painted the brick with Annie Sloan Chalk Paint in Pure White mixed 3 parts water to 1 part paint. We then came back with Annie Sloan Chalk Paint in Coco, and French Linen to add dimension and highlights to the brick. We did the same thing on the fireplace which was visible from the kitchen. Fireplace before and after painting with Annie Sloan Chalk Paint. We painted the mantle in the same colors. Don’t be afraid to paint brick or wood. It always, always looks better and you can’t lighten up a room without it. Paint your walls– Our new favorite neutrals are the beigey-greys. Some of our no fail Sherwin Williams colors are: 7043 Worldly Grey, 7044 Amazing Grey, a nice concrete grey is 7064 Passive, a nice blue grey is 7057 Silver Strand, and my favorite beige is 7036 Accessible Beige. I love all these colors paired with 7035 Aesthetic White trim. For some additional paint color ideas check out our favorite paint colors on Pinterest. Remove the counter clutter– Every kitchen looks cleaner and brighter without a bunch of clutter. Use mismatched chairs– Replace a couple of chairs at your kitchen table with painted chairs, slipper chairs, or a banquette covered in a neutral fabric like linen or burlap. There you have it, my top tips for lightening up your kitchen. Don’t forget to “Pin” your favorite images above for reference later. If you are not an avid DIY-er and you would like to talk to us about painting your kitchen cabinets in the Nashville TN area, please call us at 615-500-1517 or fill out the form below to schedule a FREE consultation. The red brick re-do is absolutely beautiful. I have a small red fireplace and would love to change it. Can you please tell me your technique? Did you just do 3 solid coats (one of each color) over the whole area? Or did you dab the top 2 colors over the Pure white? We watered down the Pure white with about 50% water. After that dried we randomly applied and blended the other two colors. Good luck.